We've discussed the artistic possibilities of topographical photography in the past, most notably the photos taken from the International Space Station by astronaut Scott Kelly and published on Twitter with the hashtag #EarthArt. David Maisel has been doing some similar work, but instead of working from space, which is a bit hard for most artists to manage, he's stayed inside the atmosphere and taken his photographs from a helicopter. He currently has a series at the Haines Gallery in San Francisco entitled The Fall, a series of aerial photographs taken in Span between the cities of Toledo and Madrid. While they appear to be a series of earth-toned and neo-cubist abstract artworks, they are in fact aerial photos of land that has been heavily impacted by industrial use and abuse, poor urban planning and an excess of rapid development. Some, like the photo shown in this post, showcase the silver remains of the extraction of Borox, but some highlight the massive yet abandoned residential construction palettes. It's quite remarkable to see how regularly the patterns of human intervention converge in terms of overall style, as no matter what the source is, similar types of patterns always seem to emerge. Beauty and decay often find themselves going hand in hand, creating an odd juxtaposition of visual pleasure and conceptual horror that combine to create what Maisel refers to (perhaps somewhat pompously) as the 'apocalyptic sublime'. 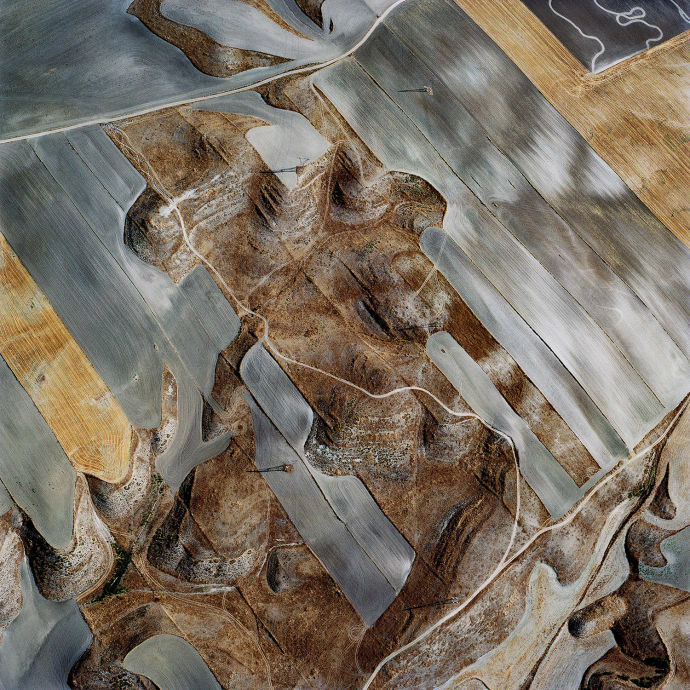 This plays well into the overarching theme of his work, which has been ongoing for nearly three decades now, primarily in the realm of aerial photographs. His overall themes tend to deal with how humanity has interacted with the landscape through industrial usage, urban sprawl, and agriculture, writ large by the scale he is able to maintain thanks to the aerial viewpoint. With degrees from Princeton, Harvard and the California College of Arts, it's no surprise that Maisel is a widely recognized and lauded artist who has received a number of awards and fellowships for his work. The latest show, The Fall, will be on display at the Haines Gallery in San Francisco from January 7 until March 12, 2016, so make sure to stop by if you happen to be in the area. If not, you can check out many of the pieces at the Haines Gallery website, which can be found here.